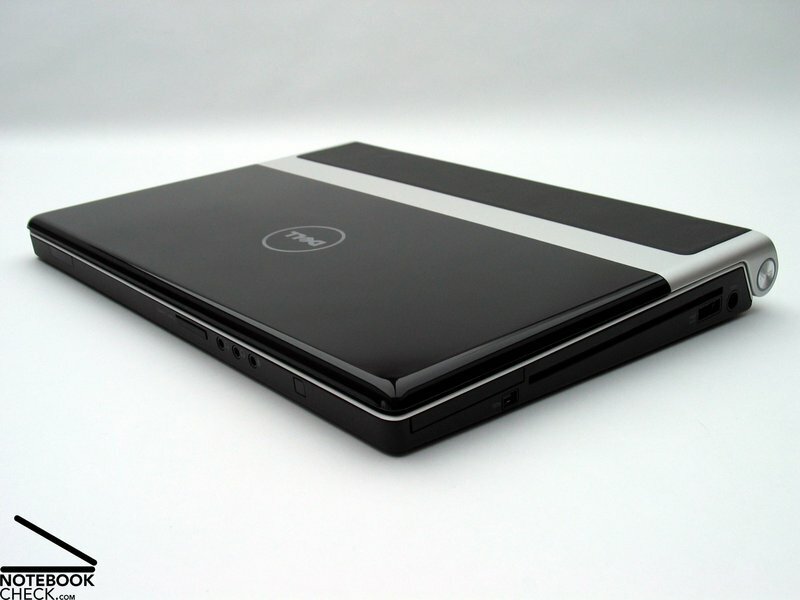 For the time being two models constitute the new Studio XPS series. 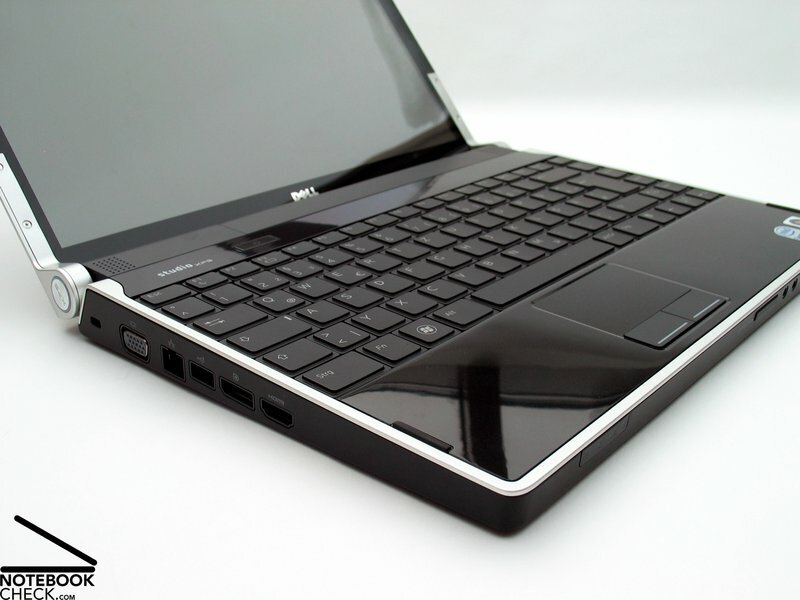 On the one hand a mobile 13 inch notebook, which can not only be seen as a persistent office notebook, but also as rather powerful multimedia-laptop, because it is equipped with an nVidia Hybrid SLI graphics. 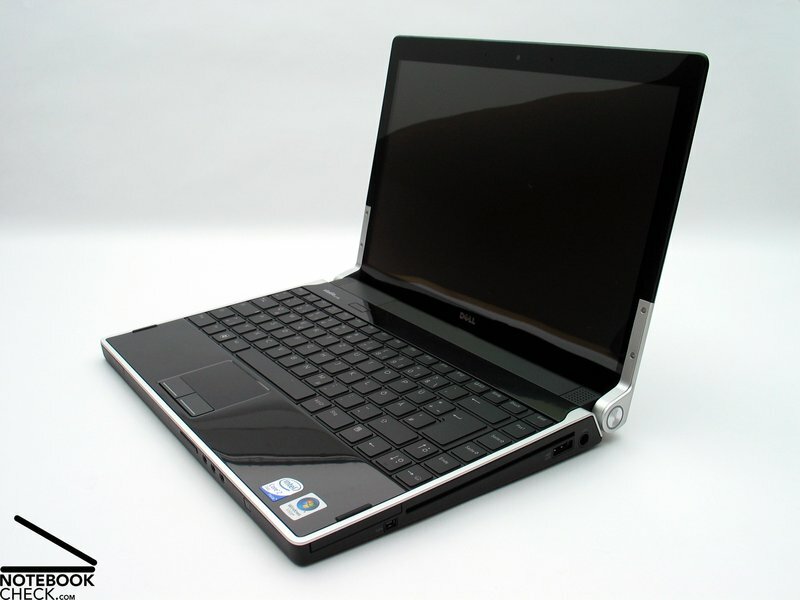 On the other hand a classical 16 inch multimedia notebook with a big field of application is offered. At first we will look at the Studio XPS 13, which is especially interesting because it combines performance and durability. Just one week ago Dell presented the new Studio XPS series in front of a number of journalists. While we could just look at pre-samples in the course of this, we now got hold of an official 13 inch model for sale, which we tested carefully. 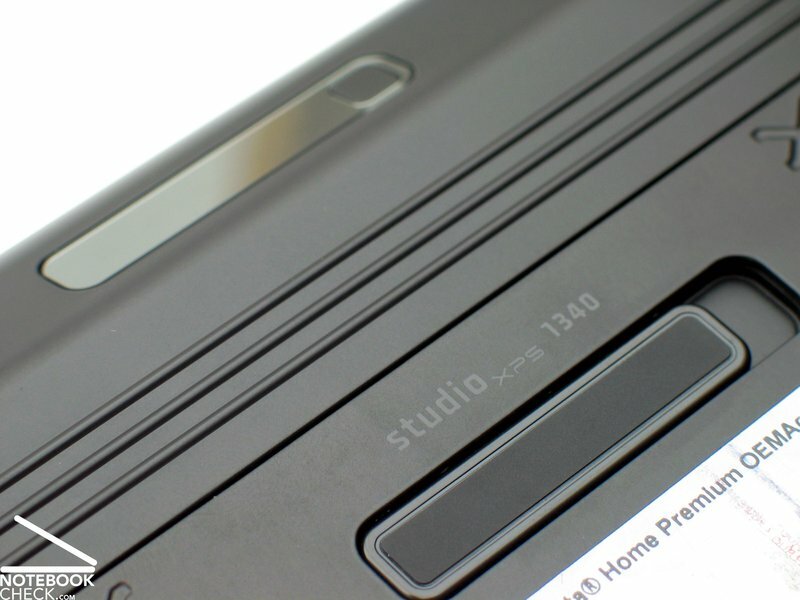 A report of our first impression of the Studio XPS 13 and 16 notebooks is available here. 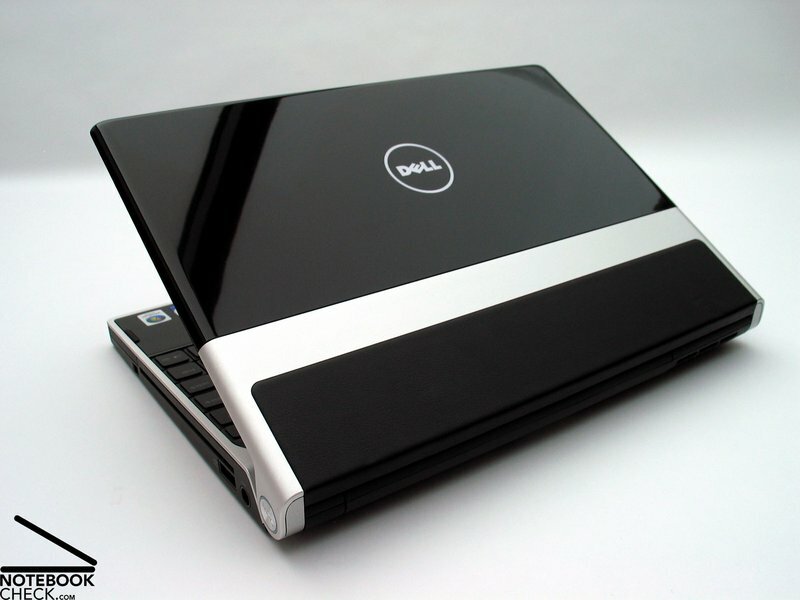 Already in the former XPS model design was considered important. In the new Studio XPS series this aspect gained even more importance. First of all, leather was used at the lid. However, the numerous deliberate details, which do not leave anything to chance, are even more interesting. Let's start with the dominant design features. The lid is covered by a total of three different components. In the top part there is a high-gloss finished plastic part. A silver aluminium diecast part, which optically separates the black high-gloss finish from the black leather element, follows. So, the lid provides several haptic experiences, whereas the leather part feels best to the touch. But, in mobile use you can experience at once that the leather element does not only look good. It allows to securely grasp the notebook there and move it from the table. Although lids are usually sensitive to fingerprints, this one escapes them. Except of the leather element, the same material change from aluminium parts to high-gloss finished plastic parts, is continued for the base unit. 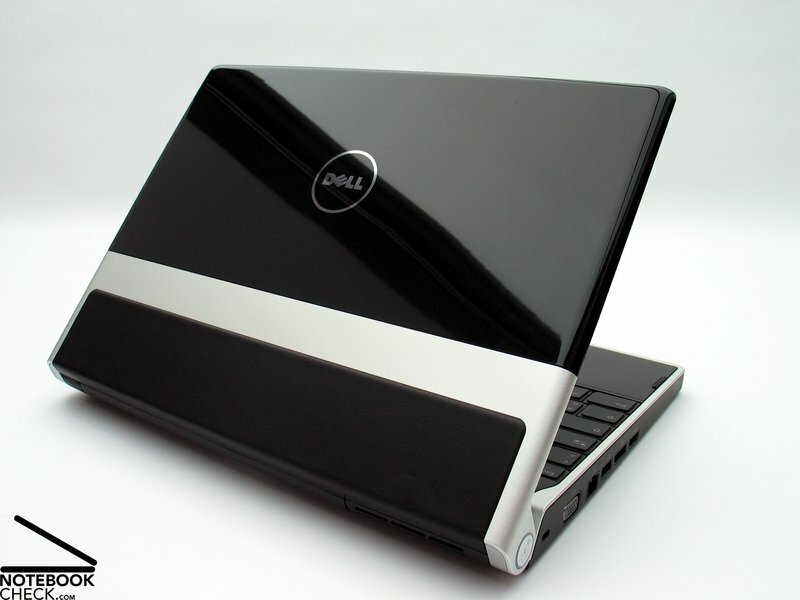 While other manufacturers resort to hides or their artificial copies for the palm rest areas, Dell prefers high-gloss surfaces here too. The test did not prove our initial concerns that the palm rest areas could be sensitive to dust and dirt, which is completely contrary to our experience with some glossy parts. The same is also true for the moulding with touch-sensitive hot keys above the keyboard. 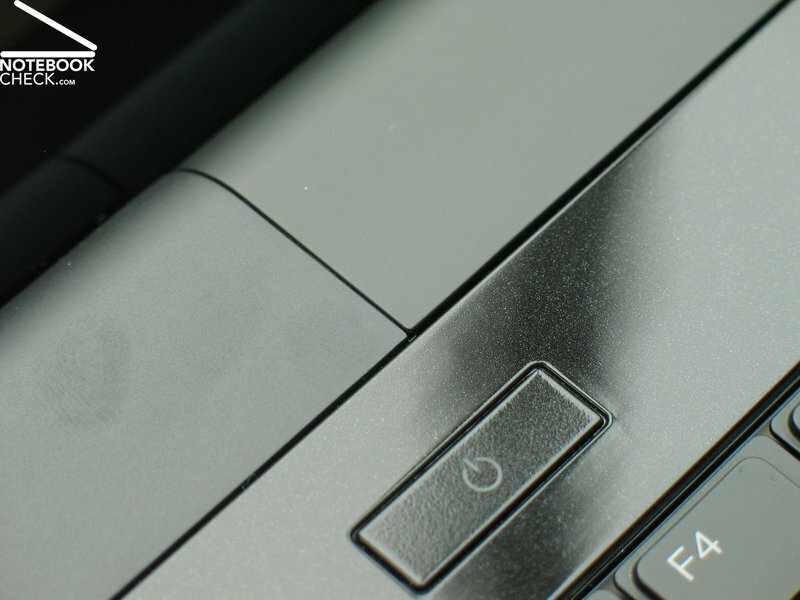 While the hot keys are hardly visible if the notebook is turned off, they are illuminated by white LEDs after power on and thereafter readily identifiable. Also the right display hinge provides decent optical charms. Their white LED visualises the operating state, and, e.g., pulses "Apple-like" in stand-by mode. As already mentioned for the pre-samples, the case is very stable and resistant against force. It is possible to pick the notebook up everywhere including the display and carry it around. Only the big maintenance opening made of a single aluminium part gives minimally at the vent holes. At the vent holes you'll find the next sophisticated detail. The cover is perforated in x-shapes for the necessary openings. To make it even clearer the letters X-PS were added to this pattern in a single place. Once again the four feet are worth mentioning. 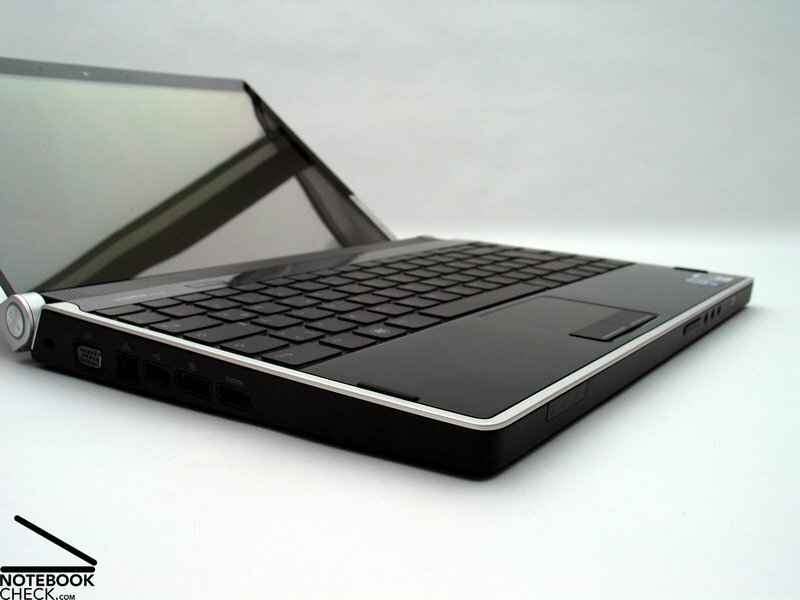 They allow to use the laptop on a number of surfaces in a very secure way without getting out of place. Admittedly, this is not the most important aspect for a mobile 13-incher, but it's also not negative. Another word to the hinges: They proved to be clearly stabler in the production model and also the gaps are preciser. But, this does not mean that they cannot be improved any more. 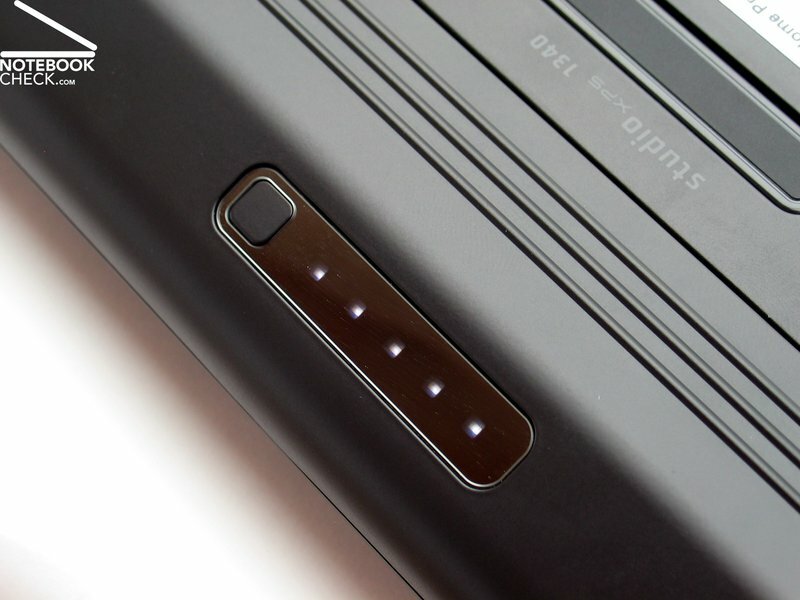 Also the fit of the battery can still be criticised. Besides some optical shortcomings, the hinges hold the display securely and they keep the notebook closed with sufficient force - an important improvement compared to the pre-sample. Although the opening angle is limited to about 145°, we did not face any problems because of this throughout the test. In mobile notebooks it is often saved on connectivity, on the one hand because of the available space and on the other hand because of cuts. This is not true for the Studio XPS 13. Providing only one standard USB 2.0 port, the number of ports is not really a strong point of this notebook, but the quality is. The left side of the case already provides important interfaces like HDMI out, digital display port, a USB 2.0 interface, Gigabit LAN, an analogue VGA out, and a Kensington lock. What about eSATA? No problem, just look at the right near the back, just before the power jack, combined with a USB 2.0 port. And FireWire is also available and that in the front part of the right side. In between there is a good-looking slot-in drive, a DVD-RW drive at the time being. So far Blu-Ray is not available. A further pro is the stability of the case in this part, which is a clear weak point of other notebooks - very good. An nVidia nForce module (Gigabit 10/100/1000 Mbps) allows fast wired networking. 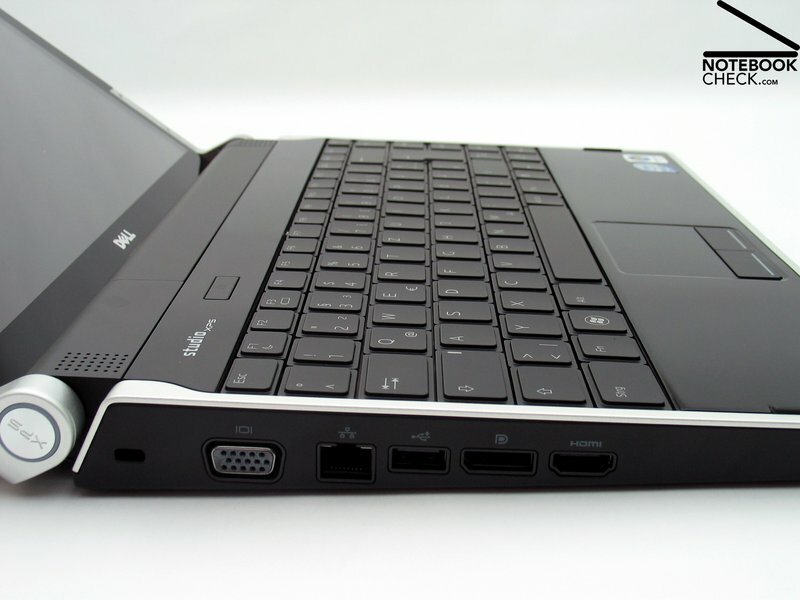 Also standard of the new Studio XPS series is wireless LAN standard-n (Dell Wireless 1515). Bluetooth (2.0) is available for a surcharge of 35.- euro. An HSDPA module for wireless Internet access via broadband is also available for a surcharge of 60.- euro. 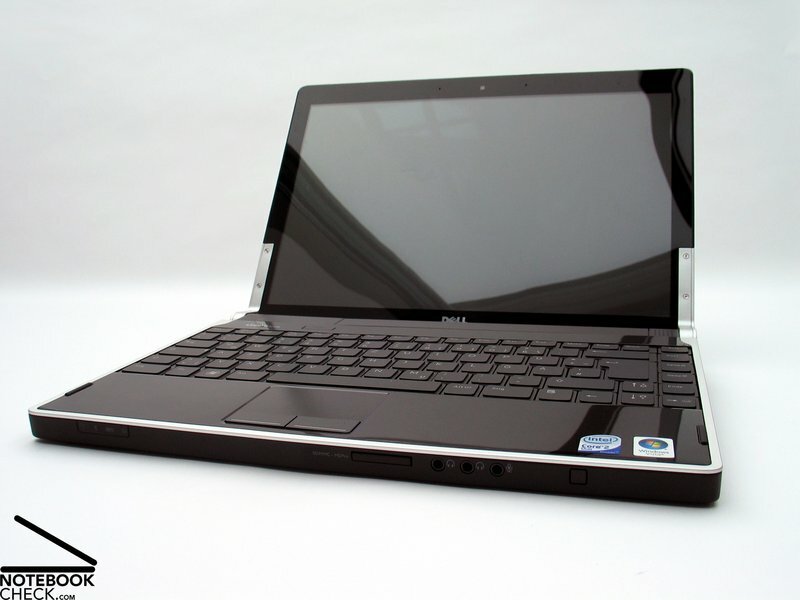 According to Dell it is also possible to upgrade the notebook with such later, because all models are completely wired and equipped with the necessary antennas ex factory. 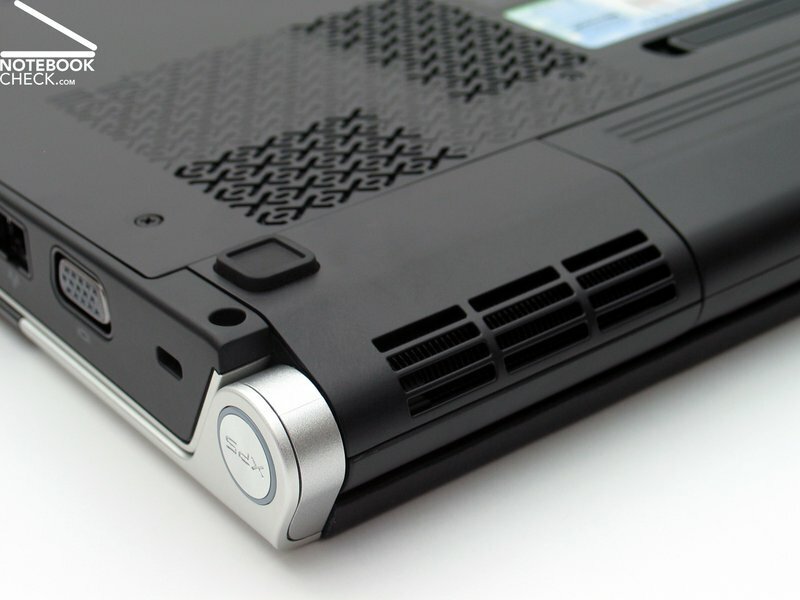 As usual, Dell also offers a number of accessories for the Studio XPS 13. These include external input devices, bags, routers, and various software - of course for a surcharge. 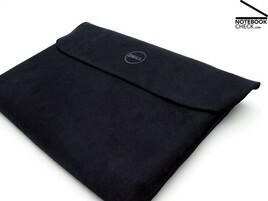 As a small free goodie Dell delivers the XPS 13 in a big coth bag, which is useful for cleaning the notebook, but also marginally protects the notebook during transportation. 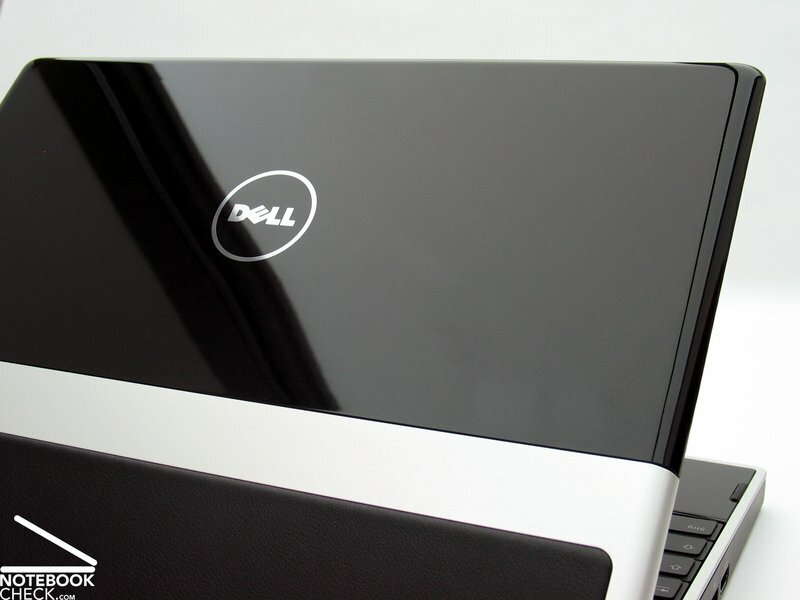 Dell offers four years XPS-Premium-Service for this system. However, most of the offered models only include one year warranty. If you do not want to do it without a longer protection, it can get really expensive. 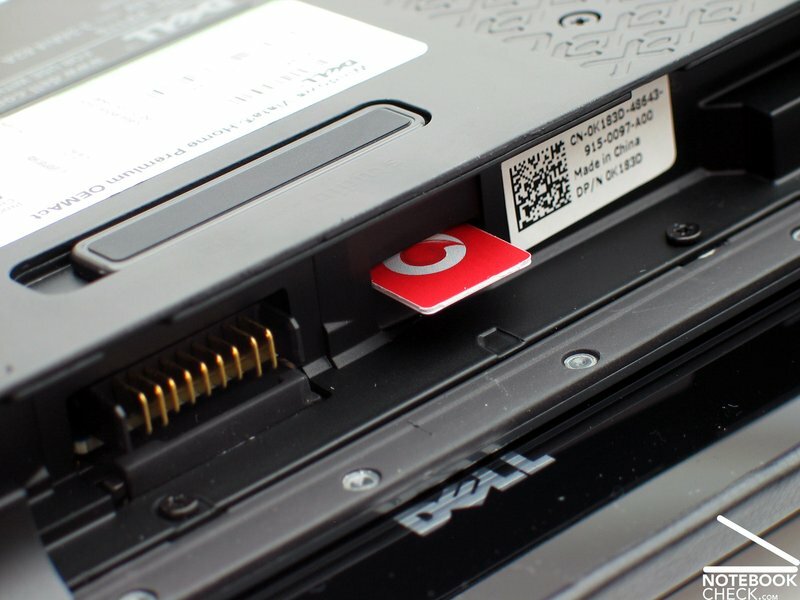 Dell offer a warranty of 2 years for 179.- euro, of 3 years for 199.- euro and a four years warranty costs even 299.- surcharge. However, the later also includes on-site service. 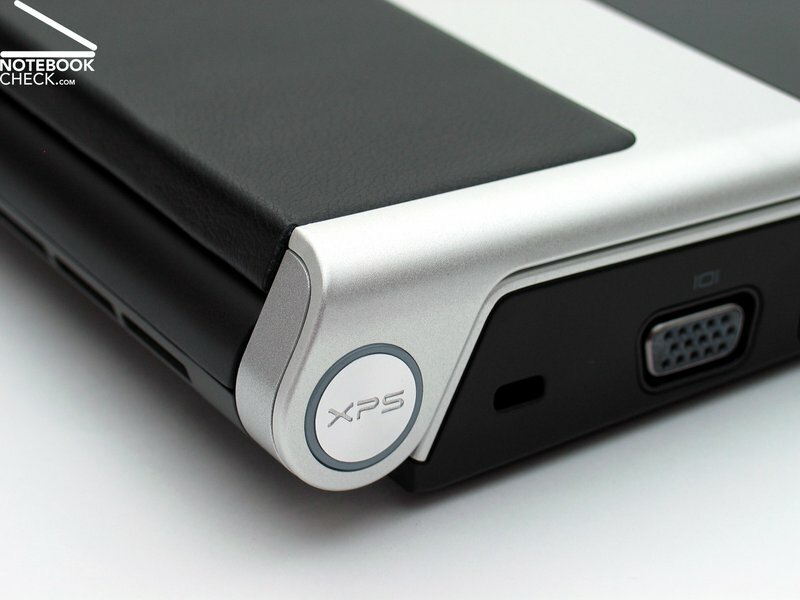 Dell's Studio XPS models do not have a fingerprint reader for access control. Instead, the integrated web cam and a proprietary software is used for this, but only if the user likes. Of course the first step in utilizing this feature is to configure the according software and store ones face and optionally also add a password. Afterwards the web cam is activated upon login. This is indicated by a white LED beside the web cam. The software looks for a face near the lens and hopefully recognizes the master of the computer. If so, the login process continues without delay. On fail, you can still login by typing the correct password. Hopefully, the software learns and is more tolerant in the future. This way the software learns to accept changes like a new hairstyle or wearing glasses. 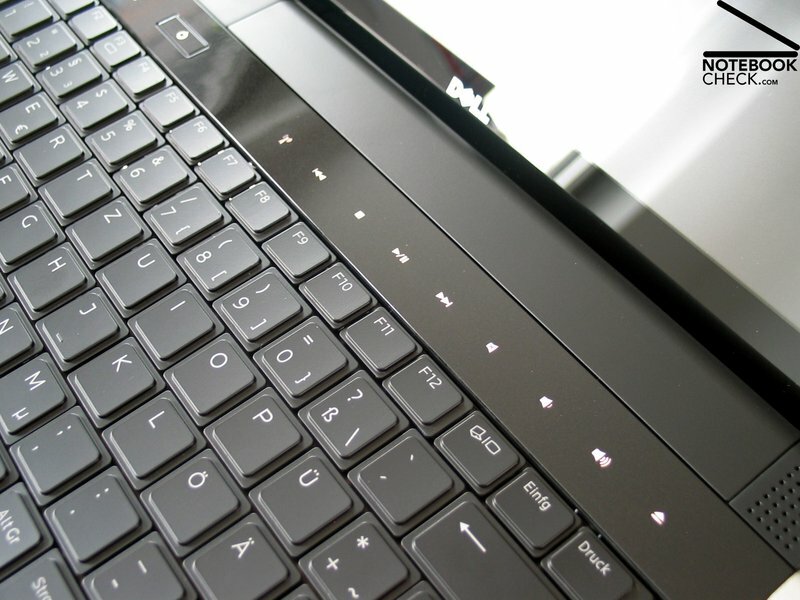 Dell designed a special keyboard for the Studio XPS notebook series. This can be easily distinguished from those of other series by its striking surface design and a special font. 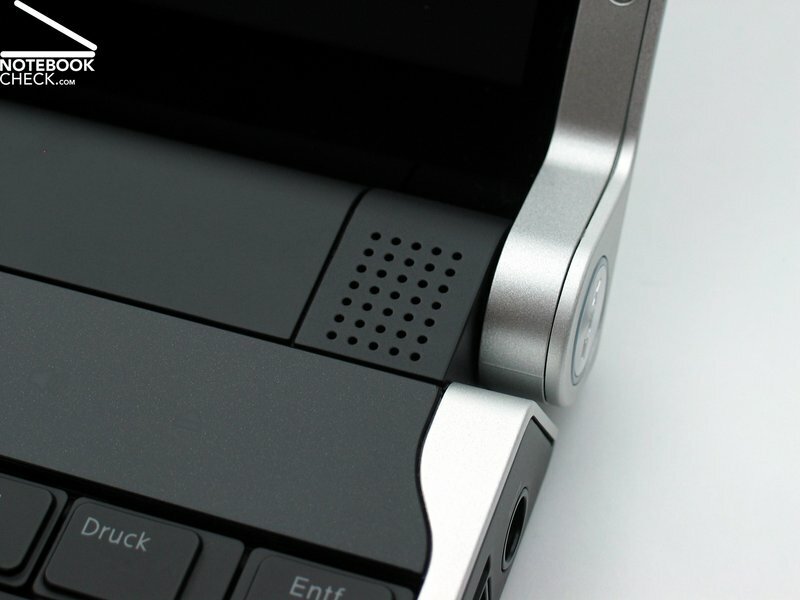 The keyboard is really flat, and the actual typing area is moved about 2 mm from the key edge. The layout appears to be rather clear, and also the key size turned out to be user-friendly in the test. This compensates for the rather dense layout without all-too big gaps between the keys. Maybe the a little bit uncentred keyboard and the touchpad needs getting used to. The reason is the key row right of the keyboard. The illumination of the keys is very good. A decent light, not at all uncomfortable, can be seen through the letters. So, using this notebook in dimmed environments gets pretty easy. A further advantages is that light shines with hardly any exception only through the labels and not for instance much through the gaps between the keys. This guarantees a first class contrast for typing. 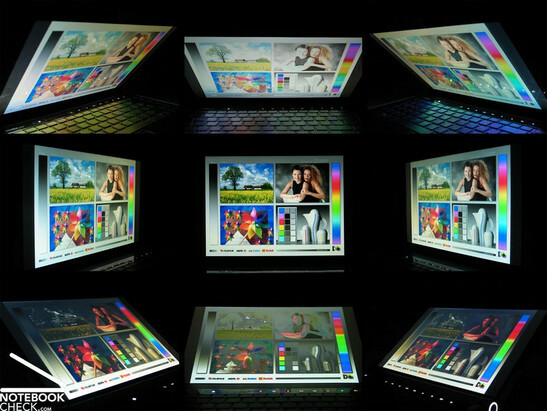 Furthermore, it is even possible to adapt the brightness of the illumination in three levels. In addition also the illumination of the active Caps-Lock key is very useful. 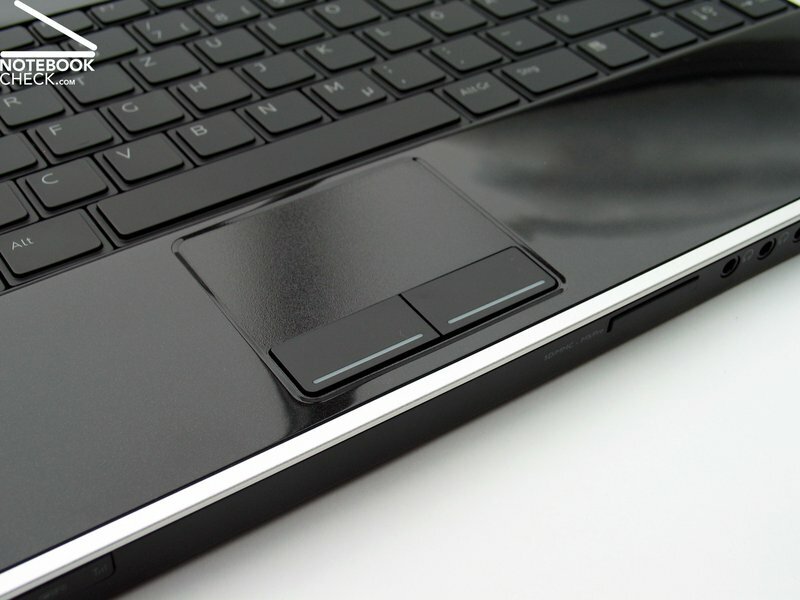 The touchpad has a slightly roughened surface with rather good gliding properties. 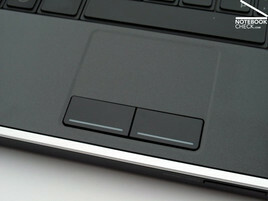 Also the two buttons score points by a feeling typical for Dell, that is soft feedback and good key travel. Apropos feel of typing, we liked the keyboard with its short key travel and think that it is also ready for typing long texts. The decent tapping also contributes to this. In the test we recognized that the pad has multi-touch features. You can e.g. zoom documents with two fingers. However, the standard scroll option, for which two fingers move across the pad, was not available. Dell offers two display models for the Studio XPS, an entry-level solution, i.e., a WXGA CCFL panel with a resolution of 1280x800, or a LED panel with the same aspect ratio. However, the later costs 70.- euro more. Both models have a TrueLife surface, that is a completely glossy "edge to edge" design. 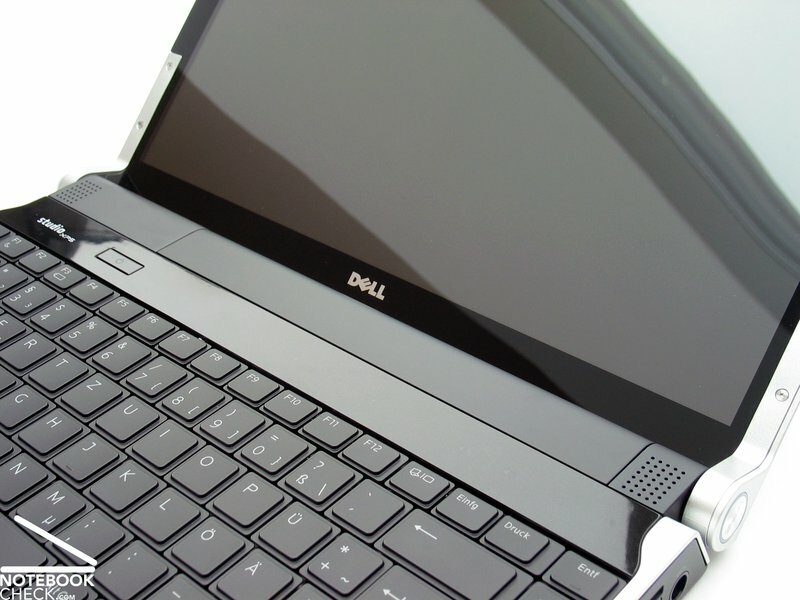 According to Dell the LED model should be brighter and thinner than the CCFL screen. We had the joy to test the white-LED model and measured a maximum brightness of 254 cd/m² in the middle of the screen. Towards the bottom edges the brightness falls down to 202 cd/m². So, the illumination of this panel is just 79.5%. We had a rather good subjective impression of the screen's picture. The colours appear strong and also the contrast is alright. Surely, the reflecting TrueLife surface considerably contributes to this. According to our measurements the maximum contrast is 438:1 (black value: 0.58 cd/m²). In any case the reflecting surface contradicts outdoor operation. Nevertheless the display should be sufficiently bright for even providing sufficient contrast in bright environments. In horizontal direction this display has as usual bigger viewing angles if you prescind from reflections at acute angles. We were a little bit surprised by the vertical viewing angles, which turned out to be bigger than usual too. 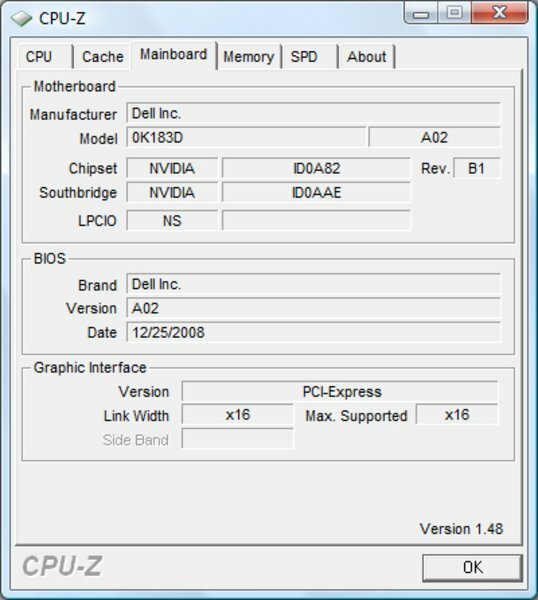 In regards of processors Dell only offers P-series models of the Intel product range for the Dell Studio XPS 13. The reason is that these have a clearly lower TDP25 of only Watt compared to the T-series chips, which have a TDP of 35 W. So, you can choose between a P8400 CPU with 2.2 Ghz, a P8600 CPU with 2.4 GHz, and P9500 CPU with a clockrate as high as 2.52 GHZ, 6MB L2 cache, and 1066 MHz frontside bus. Considering the price/performance ratio the P8600 should be top. This is available for nearly 50.- Euro extra cost compared to the entry-level version with P8400 CPU. 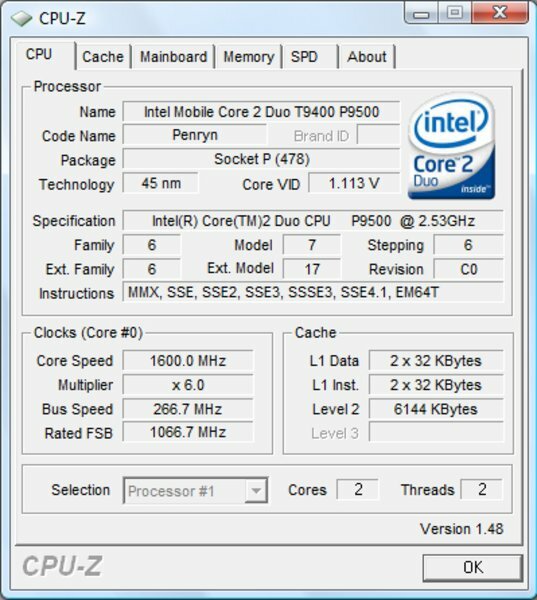 Detailed tests of the current Core 2 Duo Penryn CPUs are available in this special article. Regarding the graphics card not that much choices are available. You can either select the integrated chipset graphics from nVidia, the Geforce 9400M G, or a combination with dedicated Geforce 9200M GS graphics card via nVidia Hybrid SLI (Geforce 9500M G). The later costs about 80.- Euro more. Thanks to the nVidia Hybrid Power & Boost technology this combination of integrated graphics chip and additional dedicated graphics card can reach the performance of the middle-class of comparable multimedia notebooks. 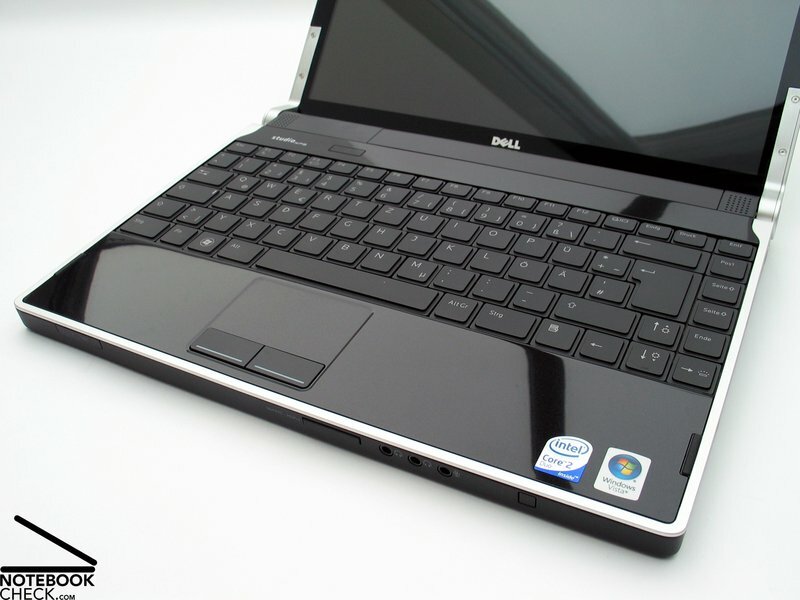 In the test the XPS 13 achieved, e.g., 3442 points in the 3D Mark 2006 benchmark test, which is very good. Therewith it is about equally powerful than various multimedia notebooks, e.g., the MSI GX620 with Geforce 8600M GT graphics or the Asus M50S with ATI HD3650 graphics. The huge difference between integrated graphics chip and active hybrid SLI graphics card gets also clearly apparent. We can also give a positive summary conerning the results of the PC Mark 2005 benchmark test. With 6690 points the Studio XPS 13 clearly tops various other comparable multimedia specialists. 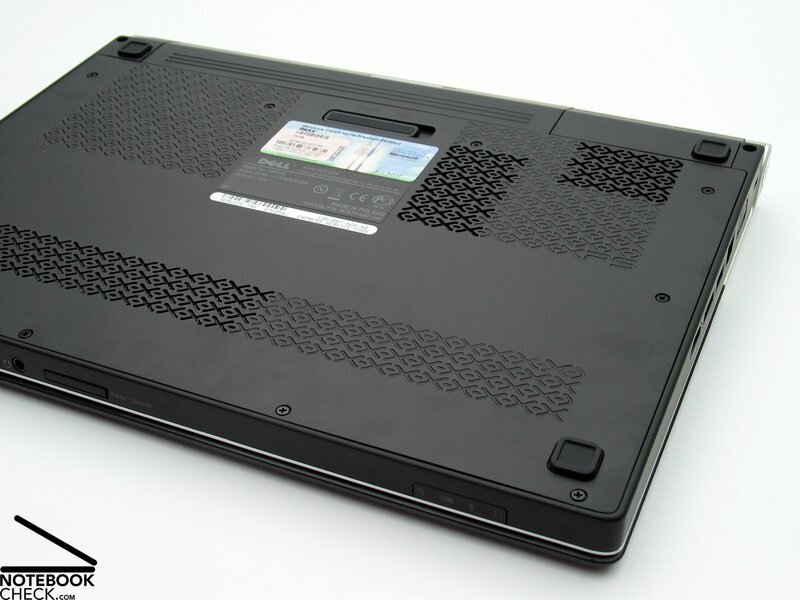 Another important aspect are the premium RAM equipment and the brilliant SSD of this system. We will describe this a little later. A striking detail in the PC Mark 2005 benchmark test is that the system is marginally better with chipset graphics (9400M) than with dedicated graphics card. 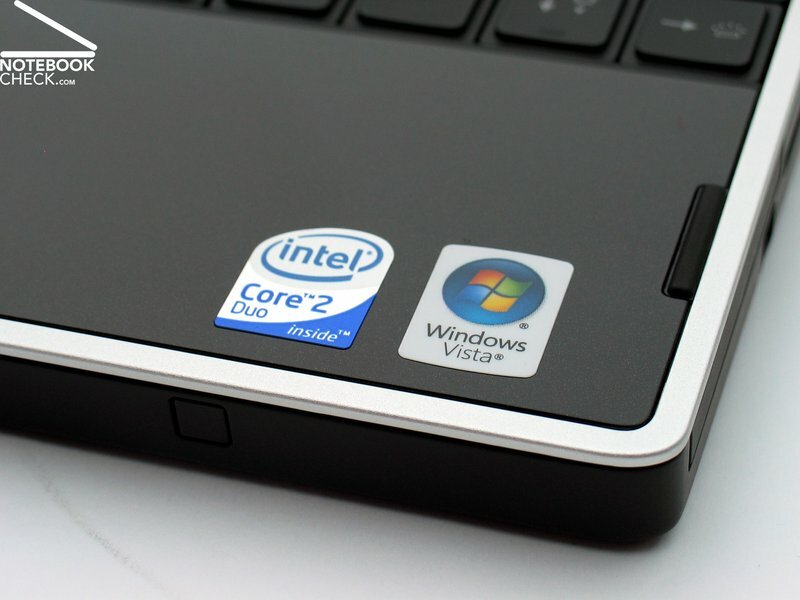 Dell equips the XPS 13 without exception with fast DDR3 RAM. Most of the advertised models have 3GB RAM ex factory, which are even supported by a 32-bit operating system. 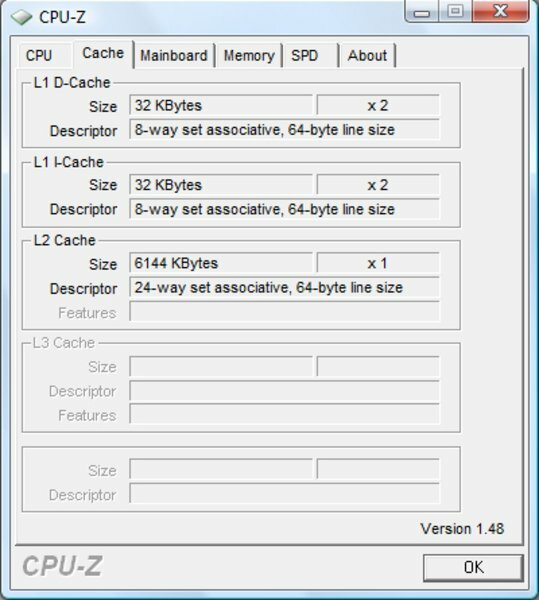 However, if you upgrade to the maximum RAM capacity of 4 GB, you should use a 64-Bit OS. Except of a 25% bigger RAM, you will also profit from a small performance gain, because the two memory modules work in dual-channel mode. 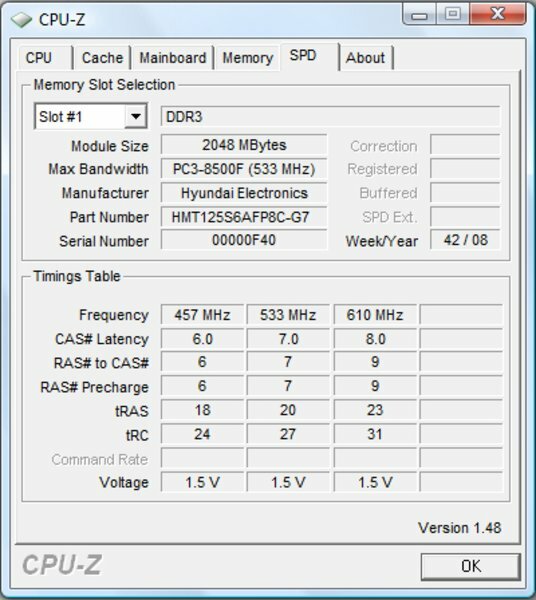 Our test sample was equipped with 2GB modules from Hyundai, in detail DDR3 PC3-8500Fes with 1066 MHz. So, this system was upgraded to the maximum denoted by Dell in this aspect. Regarding mass storage devices you can either choose from standard hard drives with revolution speeds of 5400 rpm or 7200 rpm and a gross capacity of 500 or 320 GB or a Solid State drive with 128 GB capacity. So, you have to consider three aspects for your buying decision: capacity, performance, and price. The cheapest version is, e.g., a 250GB 7200 rpm hard drive. The biggest capacity is offered by the 500GB rpm hdd. 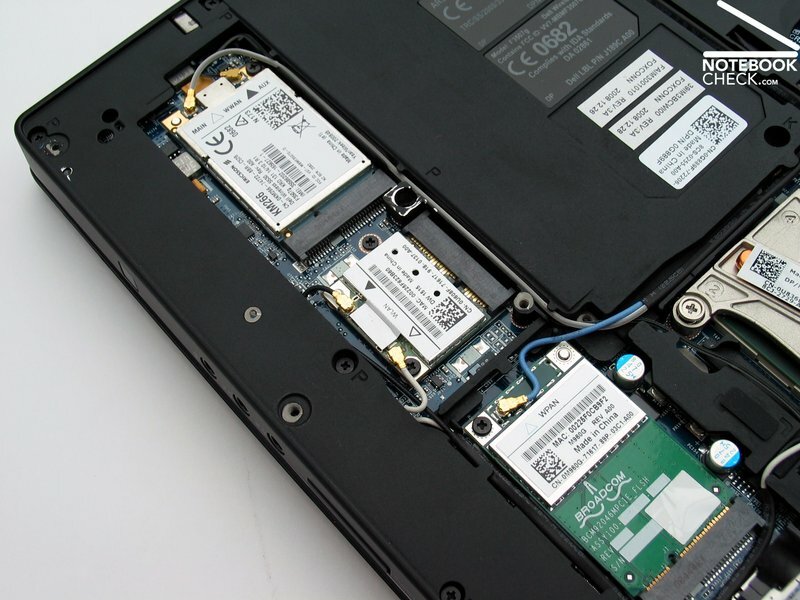 But, in terms of performance and indirectly also in terms of price, the offered SSD is top. It costs as much as 360.- euro more. The SSD, which was also inside our test sample, accomplished brilliant results in the benchmarks. It achieves transfer rates of up to 156 MB/s, so, you can forget about standard hard drives. Not to mention the hardly existent access times of just 0.2 milliseconds. 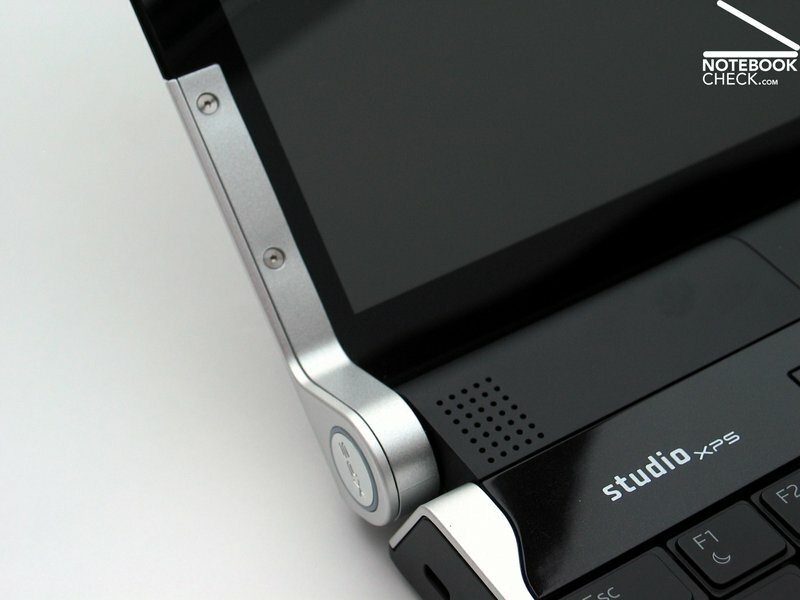 Because of the good result in the 3D Mark 2006 benchmark, one question arises: Can the gaming performance of the Studio XPS 13 be compared with system with 8600M GT, or is the 3D Mark score only nice to look at? In the meanwhile somewhat old games, Doom 3 and FEAR, the Geforce 9500 graphics solution turned out to be rather gaming-friendly. E.g., in Doom3 it achieved a rather playable frame rate of 44.1 fps. Even solely with the chipset graphics (9400M) 44.0 fps were possible. 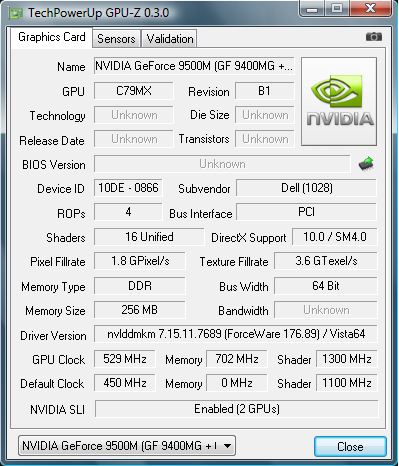 Thereby the nVidia Hybrid SLI does not seem to be better. Furthermore, system with similar 3D Mark score, e.g., the MSI GX600 with Geforce 8600M GT clearly exceed these results(87.9 Fps bei ultra). The lead of the 8600M GT is not that big in, e.g., the driver-sensitive shooter FEAR, a DX9 based game. But, here you can especially with high details detect differences between 9400M and 9500M graphics. We chose Crysis with a resolution of 1024x768 as representative of demanding games. From the very beginning it was clear that it does not make any sense to try detail level high. Even gaming notebooks like the M17 from Alienware are not capable of this. However, at least for the sake of comparison the detail levels medium and low are of interest. 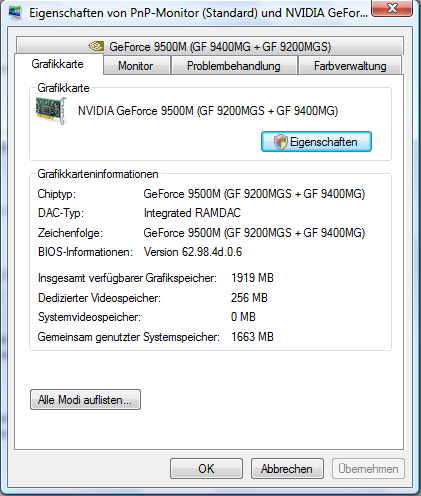 This gives a clear advantage for the Geforce 9500M graphics card over the integrated 9400M graphics card of about 20%. This can, e.g., on low details be essential for playability or not. Furthermore, it gets once again obvious in comparison that a Geforce 8600M GT is indeed clearly more powerful and able to get the lead over the Geforce 9500. Current multimedia hardware like, e.g., a Geforce 9600M GT, are definitely outside the scope of this graphics solution. We gave it another try and tested the popular multi-player shooter Call of Duty 4 in practice. The key question was, whether this game can be played to some degree with Geforce 9500 graphics solution? The recorded frame rate when playing part of the first single player mission led to the following conclusion: The difference between or more precisely the advantage of the Geforce 9500 graphics card increases with the demands on graphics (resolution, anti-aliasing, ...). The frame rate won't get to some extent reasonable, before activating the 9500 graphics cards, reducing the resolution to 800x600 pixels and deactivating anti-aliasing. Once we did, we recorded frame rates, which mostly exceeded 30 Fps. Deactivating further graphical options, could lead to further improvements, and so might result in Call of Duty being playable to some extent with this hardware. The hybrid SLI technology from nVidia does not only allow interesting fields of application. This notebook also scores points in regards of noise emissions. With energy profile balanced, which means that the Geforce 9200M GS graphics card is activated by default, the fan runs even without load in idle mode virtually without interruption. Although the noise level of 32.5 dB(A) was not inconvenient, the notebook was clearly audible. If you choose the energy saving profile from the energy options, the dedicated graphics card will be deactivated and the fan falls silent within seconds. We could do simple work like typing text or browsing the Internet and the fan stayed silent. 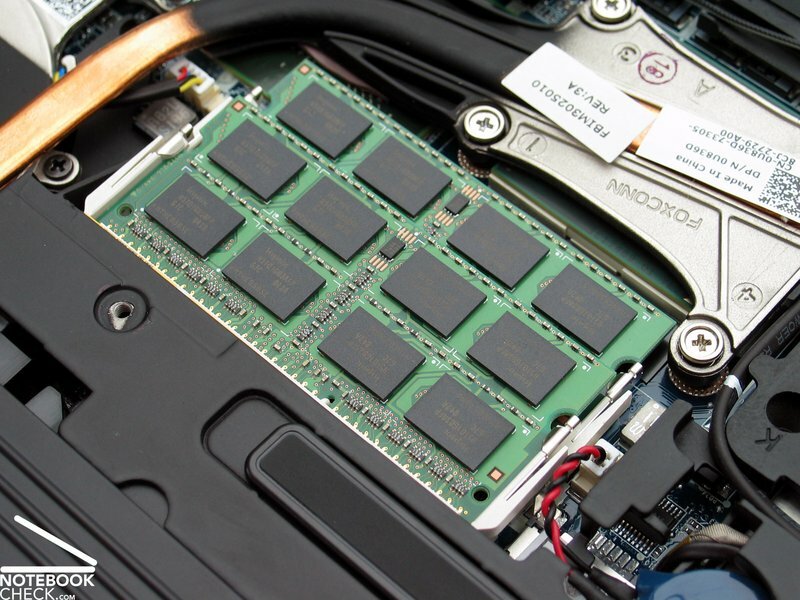 Because of the noiseless SSD in our test sample, the whole system was silent in this state. After about 80 minutes in this state and with room temperature of 23 Celsius the fan was activated, ran, and got silent again a while after. At that time we could measure a noticeable heating of the case. The maximum temperature was 41.9 °C on the top side and 42.8 °C on the bottom side. Thereby we used the notebook on a standard hard desk. With constant load the fan caused a noise level of about 41.0 dB(A). Sometimes the recorded noise level was even 46.4 dB(A), with which the Studio XPS 13 can already be disagreeably loud. As already mentioned, the recorded surface temperatures were without load and with deactivated dedicated graphics card comparably high. The case has to release heat to the environment in this state, because the fan stays most of the time deactivated. Of course this works only, if a large area gets warm. 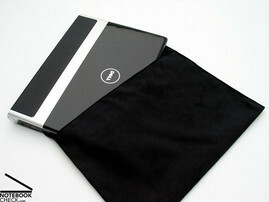 If you work with this notebook on your laps, the temperatures of about 40 degrees Celsius can get inconvenient. However, under loud the measured surface temperatures are even clearly higher. The top side of the base unit reaches up to 48.1 degrees Celsius on some points and large areas of the bottom side heat up to up to 48.8 degrees Celsius. This is acceptable if you use this notebook stationary on a desk. But, you should definitely avoid operating this laptop on your laps or on soft textile surfaces. The two integrated loudspeakers are left and right above the keyboard beside the hinges. Due to this position, their sound is rather present, but it slightly lacks sonority. A subwoofer would be an ideal supplement. 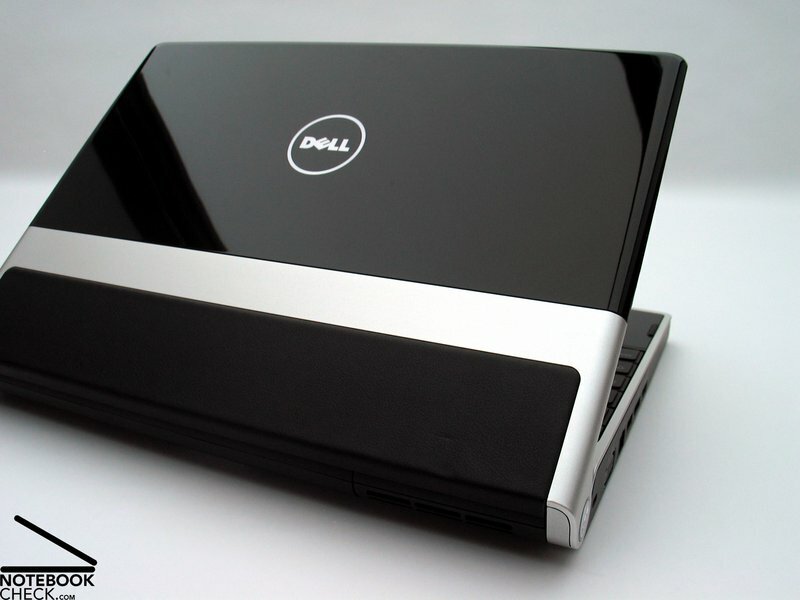 Dell equips the Studio XPS 13 with a lithium-ions battery with a capacity of 53.7 Wh. At the time of writing alternatives are not available. So, the compact multimedia notebook does not really have a long battery life, but an acceptable mobility is guaranteed. On maximum energy saving (WLAN off, min. brightness, energy saving profile) the runtime was about 200 minutes. The worst case scenario, that is load, maximum display brightness, and activated WLAN, the battery was empty after about 70 minutes. The detailed BatteryEater protocols will follow shortly. In WLAN mode, i.e., browsing the Internet with maximum display brightness, however, with energy saving profile (Geforce 9400M), we recorded a rather good runtime of 175 minutes. But, the battery life when watching a DVD was clearly worse: 120 minutes could be slender for some films. The new concept of the Studio XPS model seems successful. 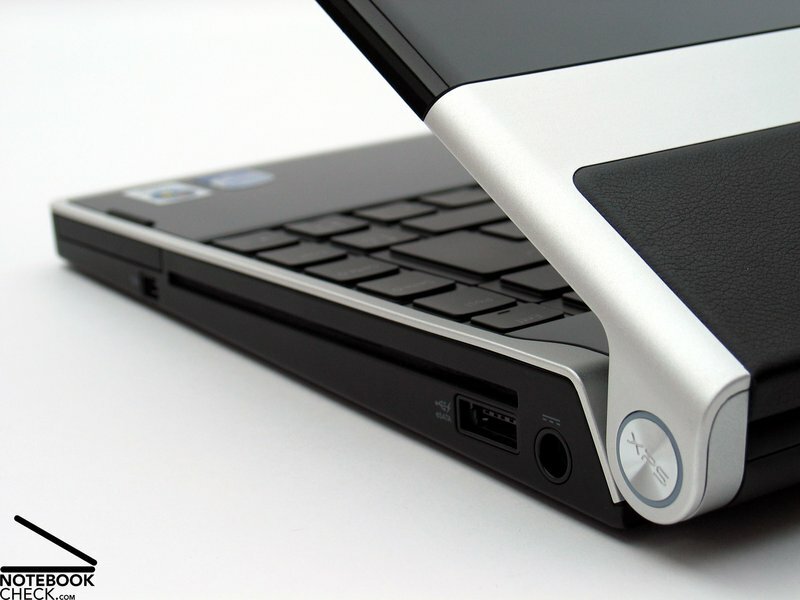 The XPS stll claims a high performance. And Dell rightly places emphasis on the hybrid solution from nVidia. So, it was not only possible to provide proper reserve capacities, but also fulfill properties typical for 13-incher, e.g., a slim case, a decent noise level, and also sufficient mobility. The case could also convince in many aspects. E.g., regarding used materials and stability. We also liked the numerous sophisticated details, e.g., the new locking mechanism for the battery, the LED illuminations, or the especially designed vent holes on the bottom side. 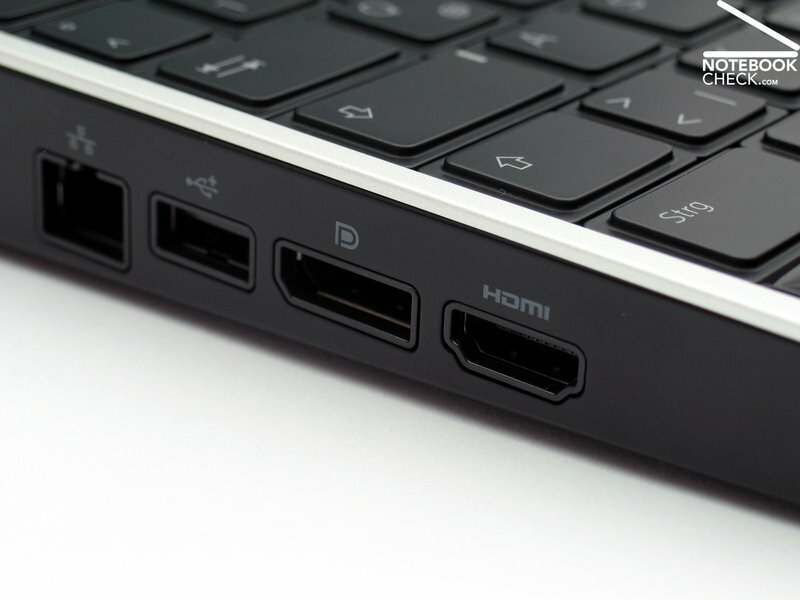 The connectivity should thanks to display port, HDMI interface, and eSATA port include everything needed for a mobile multimedia notebook. Gigabit LAN and draft-n WLAN are available by default, HSDPA is an option and retrofittable. Considering a total price of 1000.- euro, a surcharge of 35.- euro for bluetooth should not be really asked for. The Dell Studio XPS 13 has a beautifully illuminated keyboard and this by default for no extra costs. However, the keyboard is not only nice to look at, it is also fit for intensive typing. The performance is appropriate for a 13-inch model. 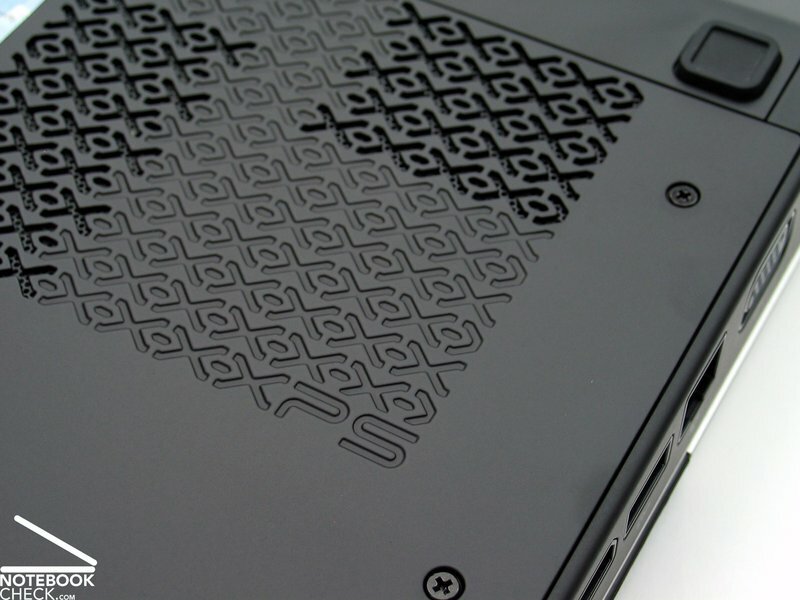 Especially, the hybrid SLI technology from nVidia inside the black and silver case attracts attention. 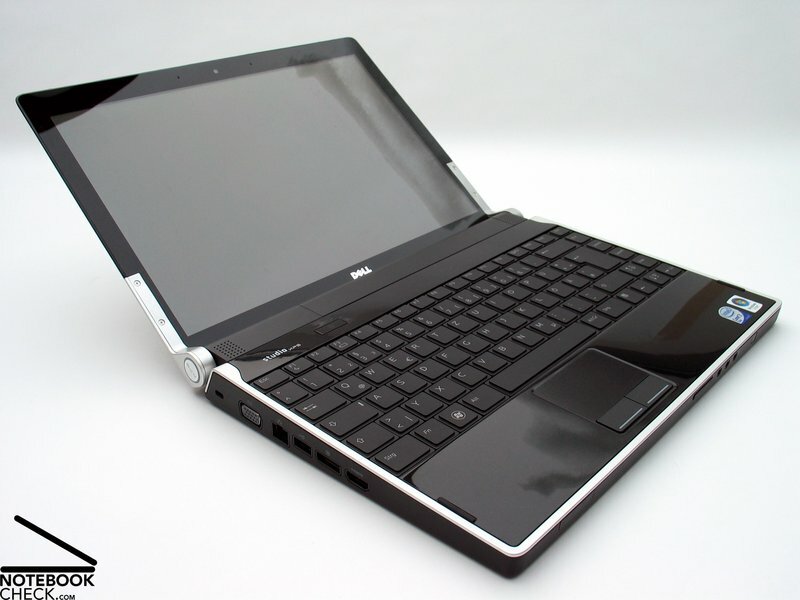 Dell succeeds in creating a notebook which at least partly runs nearly inaudible. So, not only ambitious multimedia user might be happy with it. Of course also the XPS has some weak points, e.g., some smaller weaknesses regarding gaps, a reflecting display with average resolution, partly high surface temperatures, and a maybe too short battery runtime. 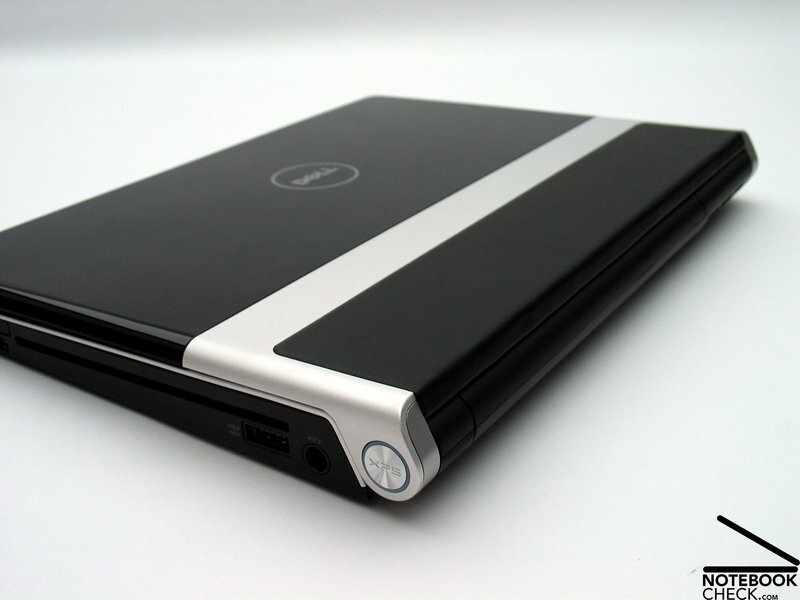 To summarize, the Studio XPS 13 is a rather successful notebook, which may worthily carry the XPS logo into the future. The Dell Studio XPS 13 is the first of the brand new multimedia notebooks from the Irish manufacturer we review. This LED panel is bright and has a good contrast. Inside the Studio XPS 13 there works a P9500 Prozessor from Intel. ...all built-in hardware components can be easily accessed. 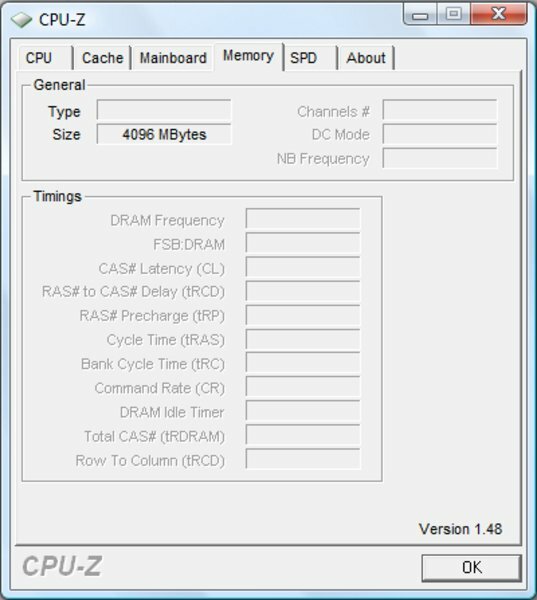 Dell only offers DDR3 RAM, whereas 4 GB are maximum. Furthermore, this notebooks can work with a number of extension cards, e.g., bluetooth, WLAN, and HSDPA. 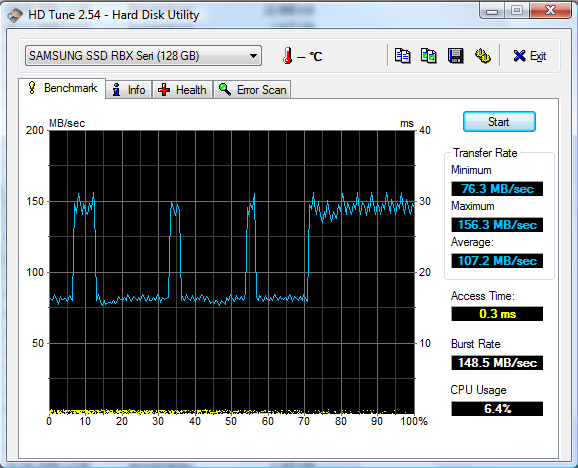 The integrated mass storage devices of the test sample was a very fast SSD from Samsung. Despite powerful hardware, the XPS 13 can partly run without fan in idle mode. Under load, the built-in fan causes a rather high noise level. The top side of the base unit gets considerably warmer, whereas a level of up to nearly 50°C is reached. In order to ensure a sufficient air flow, the maintenance opening has X-shaped perforations. The built-in loudspeakers provide a quite acceptable sound, but, the sonority could be better. 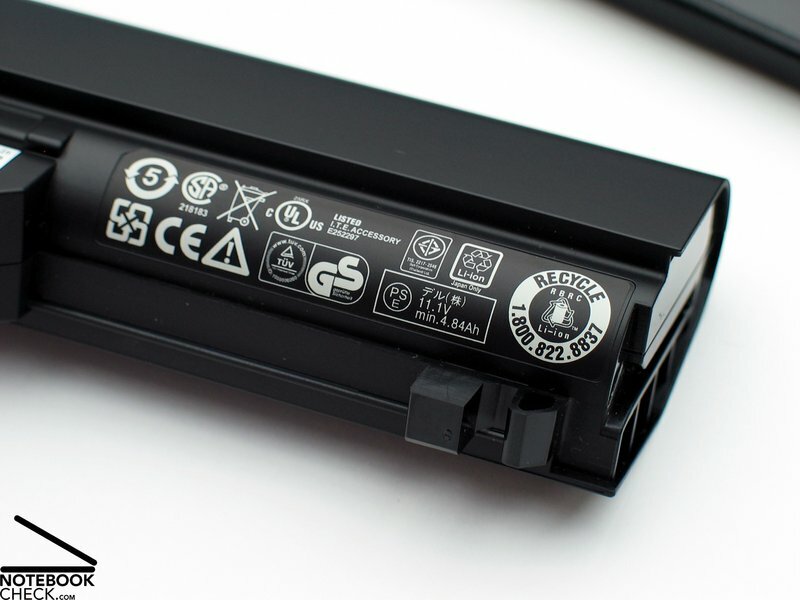 The locking mechanism of the battery was also redesigned. 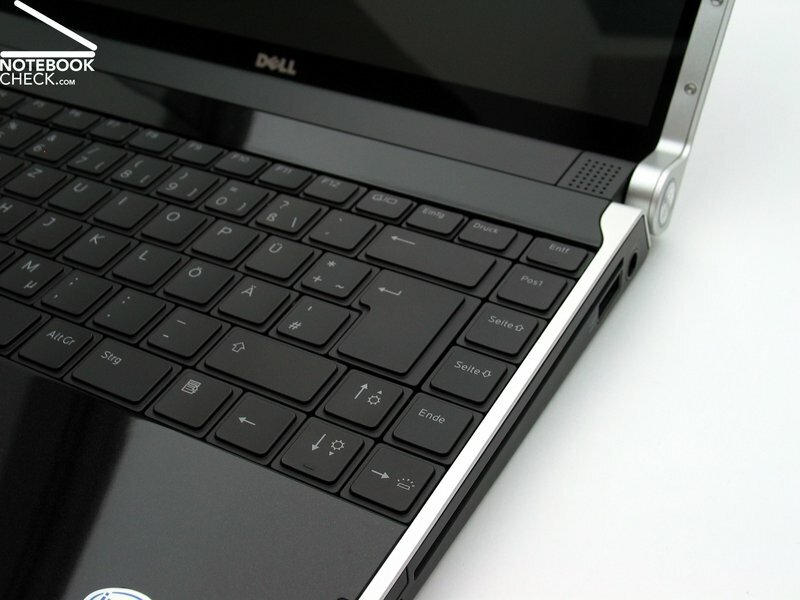 The Dell Studio XPS 13 utilizes a lithium-ions battery with a capacity of 53 Wh. 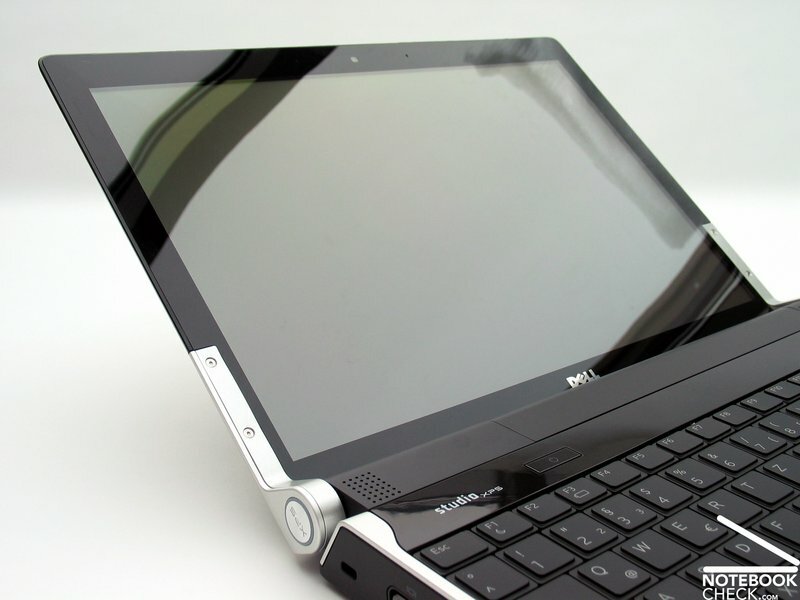 In the test the notebook reached a runtime of up to more than three hours. 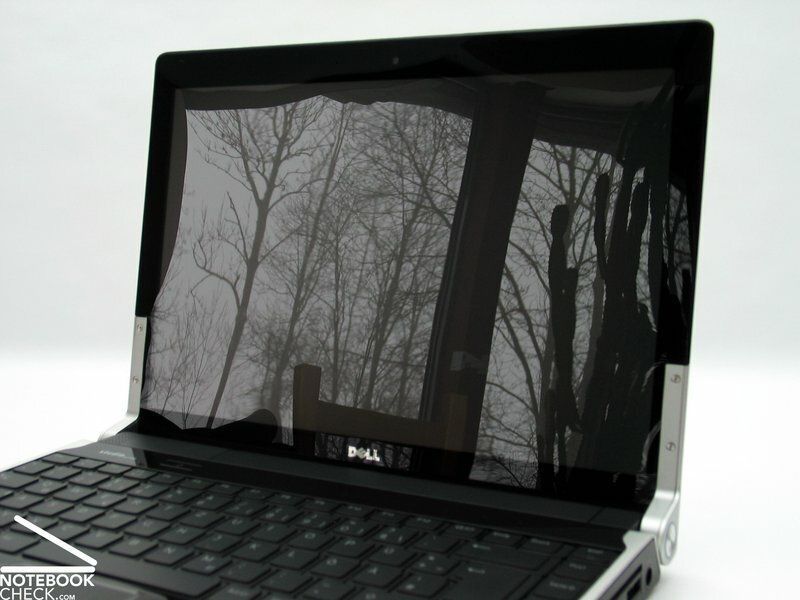 Dell went for a reflecting TrueLife screen in 'egde to edge' design. 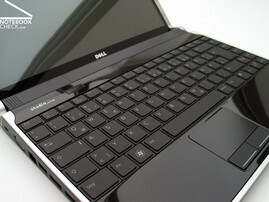 The touchpad has the usual advantages Dell is known for, e.g., comfortable touchpad buttons. ... and convinces by the use of high-quality materials. ...to leather on the lid. In regards of workmanship this notebook has the one or other weak point. Especially the gaps between the parts could still be improved, especially at the battery. ...e.g., the new plastic feet which ensure an excellent hold on nearly all surfaces. The notebook provides nearly all usual ports. This includes display port, an HDMI interface, and an eSATA port for connecting an external hard drive. 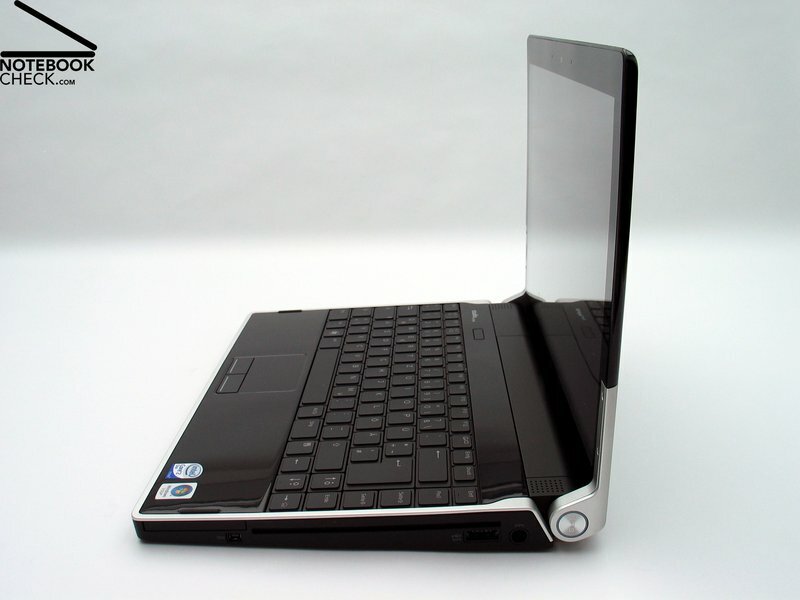 The optical drive is a slot-in unit and further contributes to the look of the notebook. 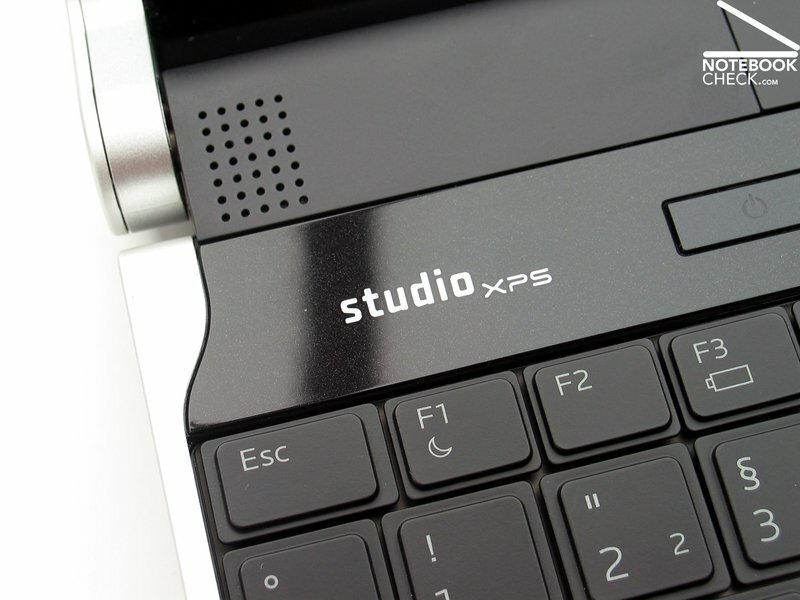 For mobile broadband Internet access the Studio XPS 13 is also UMTS/HSDPA ready. Also the keyboard was optically adapted to the XPS design and got even a special font. In addition the keyboard is illuminated – a nice feature for no extra cost. 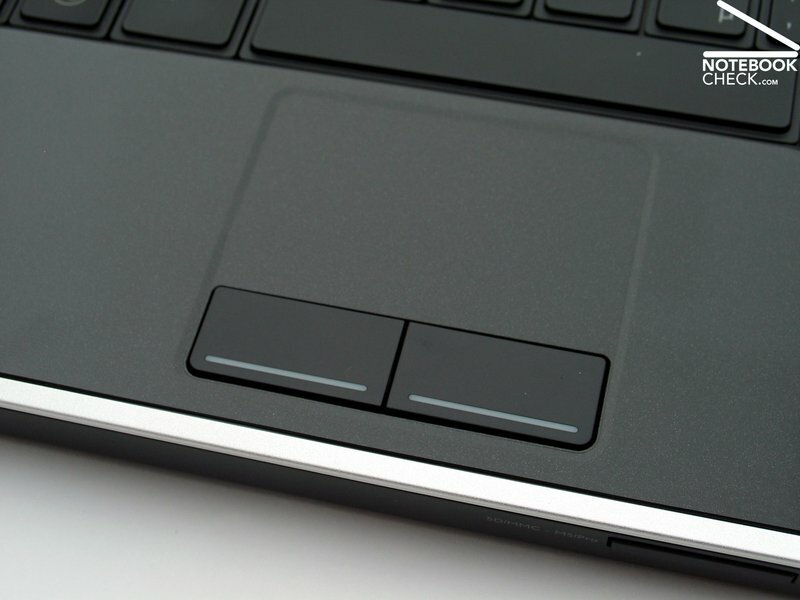 The touch-sensitive hot keys are also illuminated and, so, using them got even easier. Considering the provided performance, this is acceptable, but, you'll nevertheless quickly reach the limits of the Studio XPS 13's mobility. Definitely, the hybrid SLI concept from nVidia. Performance and composure in a single device - very good, and also developable. More distinguishability. The same barebone is also offered by other manufacturers. Inside this notebook there are a CPU with 2.53 GHz and a graphics solution, which nearly reaches the performance of a Geforce 8600M GT - and… Dell succeeds in creating a nearly inaudible notebook - incredible.